When you’re still playing catch-up from a vacation a few weeks ago, it can encroach on movie viewing time unfortunately. I am hoping that by this upcoming Easter weekend, I will be able to resume my breakneck movie-watching pace. For now, it looks like only a few flicks a week are on the marquee. And here are this week’s blockbuster feature presentations. Oh, as always, thanks for reading! ~ Chris K.
I had a soft spot from the moment I hit play on this flick I ordered on demand from one of my premium channels. Okay, a couple of soft spots. I happen to think Charlize Theron is pretty damn awesome, and among the loads of speedy spectacular winners that she has co-piloted or been a driving force, she has also picked quite a few jalopies to ride in, too. But I can’t help it. I always find myself rooting for her, no matter how bad the film. Then I found out Jason Reitman directed and it is based on a Diablo Cody story. Usually love films led by the younger Reitman (another 2018 flick, THE FRONT RUNNER, an unexpected exception—what a bore…click here for my recent review of that snoozer). And I adore Cody’s writing style. As if three soft spots weren’t enough, OFFICE SPACE is probably my favorite work-related film there is, so Ron Livingston will forever be cool in my book, if that were the only movie he ever did (and for having quite possibly the best film line ever and the best delivery of it! starts at 1:20 in this clip…) But that’s not all of the reasons I had a good feeling about TULLY before I watched one second of it. There’s also Mackenzie Davis. You see, Davis stars in my favorite BLACK MIRROR episode of them all — and there’s a lot of fantastic episodes! — but none of them come anywhere close to the haunting, charming and ugly cry-inducing beauty of “San Junipero.” Sigh. Look at me…I haven’t event told you a thing about TULLY and I’ve been gushing over two men and three ladies. In the film, we meet a mom so exhausted from the challenges of a new infant, a husband always on the move or leaving the caregiving to his wife (how thoughtful of him…) and a young son facing his own emotional challenges and struggles with a form of autism or another disorder on the spectrum, that all of it only adds to the stress of this mom who always feels less than others around her and is running out of steam fast. The suggestion of hiring a nighttime nanny intrigues the mom, and then one evening, she shows up as a gift on the mother’s doorstep, awaiting the chance to help the struggling mom have more time for herself. And that is about all I can and will say about the plot. See the rest of it to see where this new visitor takes the family’s lives. For me, TULLY was a very welcome surprise after seeing quite a few films that didn’t really offer any interesting twists and turns, I found TULLY move from a want to a need for me, as I realized how much I missed having a film take me on a human journey (no big special effects, loud soundtracks or dazzling scenery) — just a compelling story about people and I wasn’t sure where it might lead me, and I must tell you that I didn’t see this one’s ultimate destination coming. I highly recommend this to those who appreciate a stellar cast, the witty and sometimes brutally honest dialogue of Cody, and a director not afraid to deal with the hohum, humdrum or even those moments you would rather look away, because looking at them head-on is not such an easy task. I think the Oscars missed the boat not nominating Theron for best actress in a leading role. I found her performance moving and yet another direction for the versatile actress. I truly wanted to see this film months ago when it was likely to be nominated for a ton of Oscar categories but didn’t garner as much attention there as expected. Still, the film did nab one of the top acting categories – supporting actress for the always stellar Regina King and she’s great again here. I don’t think this actress knows how to give a bad performance. But here’s a surprise for you: the real stars are Kiki Layne (Tish) and Stephan James (‘Fonny’) as the main young couple who this film revolves around. They have been friends all of their lives, growing up together, eventually sharing first kisses and first dates, so it comes as no surprise that they would grow to become more intimate as adults. Early on in the film, Tish learns that she is pregnant — there’s just one problem: Stephan has been picked out of a lineup for a crime he didn’t commit. Much of the film centers on how two families can choose to come together (or not) when lives entwine with the future birth of a baby the families share in common. It also focuses on the challenge of proving your innocence among community members determined to find you guilty. I was really pleased with this film and where it took me as a viewer. It deals with some relevant topics in 2019, subjects not everyone is brave enough to hold conversations about among diverse audiences like the prevalence of wrongly accused and incarcerated young black men in the United States, and where that leaves these young men years from now as well as their families. 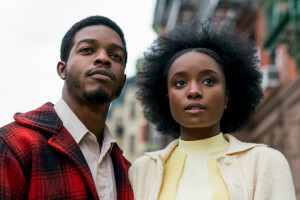 I did see MOONLIGHT when it came out, and while I liked it, I enjoyed BEALE STREET much more. I appreciated director Barry Jenkins use of tight shots that really captured the couple’s emotional intimacy as well as the closeness (and sometimes distance) between members of a family. I especially appreciated Jenkins’ use of music throughout the film. If I didn’t know better, I would have guessed it was Spike Lee-influenced in that way. I believe Lee is one of the best directors at incorporating themes for characters through the creative use of background music. There is no incidental music in a Lee picture, every note, every string, serves a purpose, and I felt the same way with this latest Jenkins film. I was swept up in the romance and small victories and crumbled along with the leading lady during times of heartache and loss, and usually these emotions were seasoned with some poignant music accompaniment. I highly recommend this film for anyone who appreciates a director who loves exploring all human emotions over the course of a storytelling experience. The new young actors who I was not familiar with really stole scenes away from actors who are usually the scene-stealers themselves (such as King, Brian Tyree Henry and Colman Domingo). Sometimes the film can slow down a bit and that might lose some viewers, but I urge you to stick with it and let your heart go along for the ride. I reviewed this beautiful picture last February when I saw it before the Oscars and was absolutely thrilled that it won Best Picture. I won’t bore you with another review but will direct you to last year’s – click here to read what I told you about the first time around regarding SHAPE OF WATER. I include it here, because, well, I did see it again this week, and I was curious if it would have the same impact. So I wanted to share how much it held up the second time around for me. The first time had the added benefit of my not knowing where the story would go, as well as the wondrous atmosphere of a big movie theater so the sound and the visuals knocked me off my feet. (I only docked it 2 points it turns out for those two factors.) But I still got goose bumps, and I still wept tears of pure love at a very significant reading of a poem that actor Richard Jenkins, the narrator, reads so tenderly. I lose it every time. I even went back and listened a third time and even knowing what I was about to hear and how everything ends with the story, I still cried! Maybe it’s Jenkins voice. I don’t know. I think it’s the beautiful words that totally captured my heart and my head. 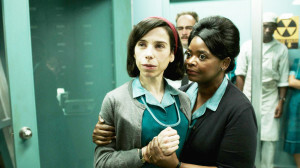 In any event, THE SHAPE OF WATER still had a hold on me, and I suspect it will be one of those beautiful fairy tales that I will watch again and again for years to come, in the great tradition of THE WIZARD OF OZ and LABYRINTH and will never stop loving the journey. 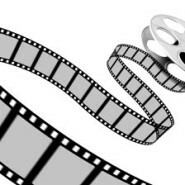 Share the post "Movie Mondays ~ Monday, April 15, 2019"